"Tesla station" redirects here. For Nikola Tesla's Colorado Springs laboratory, see Tesla Experimental Station. A Tesla Supercharger is a 480-volt DC fast-charging station built by American vehicle manufacturer Tesla Inc. for their all-electric cars. The Tesla Supercharger network of fast-charging stations was introduced beginning in 2012. as of January 2019[update], the electric vehicle network consisted of 12,011 individual Supercharger stalls at 1,422 locations worldwide. Tesla Model S was the first car to be able to use the network, followed by the Tesla Model X and Tesla Model 3. Tesla Supercharger outlets in Europe/Worldwide (left) and North America only (right). As of April 2017[update], Tesla had plans to expand the network to 15,000 stalls. When both pairs of Tesla Supercharger station stalls (A and B) occupied, they share the available power of up to 145 kW. However. those very superchargers in the thumbnail are some of the older generation superchargers, only capable of discharging 105 kW per car. (each Supercharger cabinet with twelve charger modules feeds two charging stalls (max 120 kW per car), so if two cars are charging at the same time their charging rate may be reduced). Tesla supercharging stations charge with up to 135 kW of power distributed between two cars with a maximum of 120 kW per car. They take about 20 minutes to charge to 50%, 40 minutes to charge to 80%, and 75 minutes to 100% on the original 85 kWh Model S. The charging stations provide high-power direct-current (DC) charging power directly to the battery, bypassing the internal charging power supply. The next version of Supercharging is expected to charge with more than 350 kW. In September 2017, Tesla announced the availability of Urban Superchargers. The Urban Superchargers are more compact than the standard Supercharger stalls as they will be primarily deployed in urban areas such as mall parking lots and garages. Compared to the standard Superchargers, Urban Superchargers have a maximum power delivery of 72 kW. Instead of 135 kW distributed between two vehicles at a Supercharger A/B pair, each Urban Supercharger provides dedicated 72 kW capacity. A few of the Tesla supercharging stations use solar panels to offset energy use and provide shade. In the next few years after 2016, Tesla plans to install additional solar power generation at superchargers. For Model S and X vehicles ordered through January 2017, the cost for using the superchargers for the life of the car is covered with the purchase of the car. As of May 2018, the network is exclusive to Model S, Model X and Model 3. Supercharging hardware is standard on Model S vehicles equipped with a battery of 70 kWh or greater, and optional (with a one-time payment of US$2,000) on Model S vehicles equipped with a 60 kWh battery. The original Roadster is not equipped to charge from the Superchargers, but all future Tesla cars will include the ability. In May 2017, Tesla announced that existing Tesla owners can give free Supercharging to up to five friends if they use their referral code, and all existing Tesla owners who purchase a new Model S, Model X or Performance Model 3 will receive free Supercharging on those cars. Free unlimited Supercharging with or without referral codes for new Tesla purchases ended on 09/18/2018. In the European market, Tesla has been using the standardized IEC 62196 Type 2 connector for Model S and Model X cars and Superchargers. Tesla announced in November 2018 that it was updating all Superchargers in the EU to add CCS/Combo2 connectors, as an additional connector to the existing DC over type2 connector. In the same announcement it was stated that this CCS/Combo2 connector will be the connector used for the Model 3 due the following year. This brings complete compatibility with the legislated charging standard for EU public charging. Existing Model S and X cars will be given the option of an adapter for CCS/Combo2 that allows those cars to use the EU standard public infrastructure as well. There will remain an incompatibility with imported US Tesla cars (that all use a Tesla proprietary connector). As of 2017, Tesla is the only automobile manufacturer which offers direct current (DC) charging based on the IEC 62196-2 specification. Other manufacturers use the IEC 62196-3 Combined Charging System (CCS) charging standard. Tesla has indicated on multiple occasions that they were interested in having discussions with other auto manufacturers about sharing the Supercharger network, however no agreements have been completed or made public to date. Tesla is planning to build large Supercharger stations in urban areas, with a charge rate up to 74 kW. The first "Urban Superchargers" opened in 2017. Tesla Supercharger stations allow Tesla vehicles to be fast-charged at the network within an hour. In October 2014, there were 119 standard Tesla Supercharger stations operating in the United States, 76 in Europe, and 26 in Asia. On 31 March 2016, Tesla CEO Elon Musk announced that the number of Supercharger stations would be doubled (from 613 stations with 3,628 chargers) by 2017. As of November 2017[update], Tesla operates 7,320 superchargers in 1,063 stations worldwide; these included 443 stations in the U.S., 31 in Canada, 6 in Mexico, 353 in Europe, and 230 in the Asia/Pacific region. The number of Supercharger stations grew to 280 by the end of 2014; 584 by the end of 2015; 623 as of April 2016; and about 875 expected by the end of 2016. By December 2017, there were 1,045 Supercharger Locations worldwide. By December 2014, two stations were solar powered. A solar-assisted Supercharger was opened in Belgium in 2017. The average number of Teslas per Supercharger was 34 in 2016. Cost estimates range from US$100,000 in 2013 to US$270,000 in 2015, depending on circumstances. Tesla estimates that stations last 12 years. Most charging occurs at home or work, a situation that Tesla has compared to cell phone charging. As of 2014[update], less than 10% of charging came from superchargers. Most Superchargers are owned by Tesla, but some are owned by fleet operators to charge their Tesla cars, such as taxis. These chargers are limited to 60 kW. In December 2017, Tesla changed its terms of service so that any vehicles being used as taxis or for commercial, ride-share, or government purposes were effectively banned from using superchargers. This ban only applies to vehicles bought after December 15, 2017. Other charging options would be provided for these vehicles. Supercharging is free for all Model S and Model X cars that were ordered before January 15, 2017 or for vehicles that were purchased using a referral code. Model S and Model X cars that were ordered after January 15, 2017, are limited to free 400 kWh (about 1,000 miles or 1,600 km) per year. Beyond that, supercharging will have a fee, but at a lower price than filling up a gas-powered car. Since December 16, 2016, any car that remains connected to a Supercharger after being fully charged is fined US$0.40 per minute. This fee is waived if the car is removed in five minutes. Any incurred fees could be paid at the next service visit. Tesla Model S charging at the Supercharger network station in Newark, Delaware. 2012 saw eight initial Supercharger stations around the United States, located at strategic points on the Boston-to-Washington and Los Angeles-to-San Francisco highway corridors. By mid-July 2013, 15 were open across the United States, with the number expected to nearly double by the end of the summer. The stations were developed and mass constructed in cooperation with Black & Veatch. Supercharging stations were available in Canada along the Highway 401 corridor between Toronto and Montreal by 2014. The initial network was built in high-traffic corridors across North America, followed by networks in Europe and Asia in the second half of 2013. The first Supercharger corridor in the US opened with free access in October 2012. This corridor included six stations placed along routes connecting San Francisco, Lake Tahoe, Los Angeles, and Las Vegas. A second corridor was opened in December 2012 along the Northeast megalopolis, connecting Washington, DC, Baltimore, Philadelphia, New York City and Boston; it includes three stations in highway rest areas, one in Delaware and two adjacent ones in Connecticut. At some stations, the electricity is paid by a local business to attract customers. The electricity used by the Supercharger (277V L-N of a 480Y/277V 3-phase configuration) in the West Coast corridor comes partly from a solar carport system[clarification needed] provided by SolarCity. Eventually, all Supercharger stations are to be supplied by solar power. According to Musk, "...we expect all of the United States to be covered by the end of next year ". He also said that Tesla owners' use of the network would be free forever. As of August 2017[update] North Dakota, Alaska, and Hawaii are the few remaining states without Superchargers. Supercharging stations are planned to be opened in 2018 in North Dakota and Hawaii, but there are no current plans to add one in Alaska. 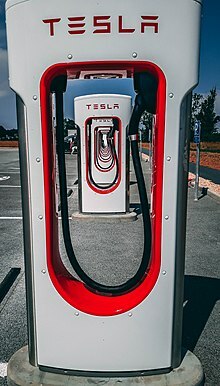 In September 2017, Tesla started adopting a new strategy of installing "Urban Superchargers" in the centers of major cities in anticipation of the mass production of the Tesla Model 3. The first Urban Supercharger stations were a 10-unit charger in Chicago and an 8-unit charger in Boston. They have a charge rate up to 72 kW and do not split power with adjacent stalls. In early 2015, the first European supercharger to be upgraded with a 'solar canopy' (a carport with solar cells on the roof) in Køge, Denmark. According to the person responsible for Tesla's superchargers in the Nordic countries, Christian Marcus, the 12-stall supercharger in Køge has 300 m2 solar cells with a projected annual production of about 40 MWh and is or will be equipped with its own battery bank for temporary storage of excess production. Unlike other European Supercharger stations, Tesla has bought the land on which the Køge supercharger stands. On April 26, 2016, Kostomłoty became the first charger to open in Poland. There are a few privately operated Supercharger stations such as the one opened on April 27, 2016, in Zarechye, Russia, with 3 stalls and also one in Jordan. By 2016, the European supercharger network is planned to allow a Model S to drive from the North Cape in Norway to Istanbul or Lisbon. As of October 2017[update], the supercharger closest to Istanbul is the one in Vrgorac (Croatia), and the ones nearest to Lisbon are Montemor-o-Novo and Fátima. The map of current and planned sites includes every European Union country except Malta and Cyprus, and represents all of the countries in the world in the top 10 of electric vehicle adoption rates (excepting, Iceland at #2). As of June 2015[update], Hong Kong has the highest density of Tesla superchargers in the world, with eight stations with a total of 54 supercharger stalls, allowing most Model S owners to have a supercharger within 20 minutes' drive. Other Superchargers can also be found in Australia, the People's Republic of China, Japan, Macau, New Zealand, South Korea, and Taiwan. Tesla also plans to deploy a nationwide network of Superchargers in India. A "Tesla station" was a planned second version of the supercharger that, as of 2013, would provide Tesla owners with extremely-fast battery pack swaps as well as fast-recharge for Tesla Model S and Model X vehicles. The company's plans changed and battery swapping is no longer a significant part of Tesla's charging infrastructure plans. By December 2014, 18 months after the announcement, no battery swapping stations had yet opened to the public. That same month, the company announced a revision to their much-delayed plans. A single battery-swap station would be opened in California as a pilot project, where only invited Model S owners could do battery swaps by appointment, to assess technical and economic aspects of the service. Demand for the priced service—which was expected to take three minutes (instead of the 90-second time demonstrated in 2013)—would be used to determine whether the company would fully commercialize battery swapping stations more generally. The original plan in the June 2013 company announcement explicitly indicated that the company would eventually upgrade all existing Tesla Supercharger stations to become Tesla stations, which would offer the battery-pack swap for the Model S in addition to the fast recharge capability that each facility initially opened with. By June 2015, the company had indicated that battery swapping capabilities was no longer a significant part of Tesla's plans for on-road energy replacement for their vehicles. In June 2013, Tesla announced the goal to deploy a battery swapping station in each of its existing supercharging stations, now to be renamed Tesla stations. At an event at Tesla's design studio in Los Angeles, CEO Elon Musk demonstrated a battery swap operation with the Tesla Model S, which took just over 90 seconds each for the two cars participating in the demo. The swapping operation took less than half the time needed to refill a gasoline-powered car used for comparison purposes during the event. The Tesla Model S was designed from the beginning to support fast battery swapping, with Tesla publicly discussing the capability as early as March 2009. By December 2014, no battery-swapping stations had been opened to the public. On 19 December, Tesla announced revised plans. They would now build only a single battery-swapping station, and institute a "Battery Swap Pilot Program" at that selected station in Harris Ranch, California in order to "assess demand." Only invited Model S owners would be able to participate in the pilot battery swaps. The company stated they would "evaluate relative demand from customers ... to assess whether it merits the engineering resources and investment necessary" for the upgrade of additional first-generation Supercharger stations. In June 2015, Tesla announced that of 200 invitations sent out to try the pilot pack swap station, only approximately five tried it. Tesla then invited all California Model S owners to try it out, but expected a low usage rate. A survey showed that most users were not interested. Tesla Supercharger stations are also available at highway rest areas. These are placed at a rest area at the Bundesautobahn 9 in Germany at the Münchberg / Nord Autohof exit. The first Tesla Station with battery-swapping capability was planned to be piloted in California late in 2013, but this was subsequently delayed. Elon Musk said at an event in February 2014 that a few battery swap stations will open in the next few months along the route between Los Angeles and San Francisco, and that the initial stations will be studied before deciding to build any more. In mid-2013 each swapping station was projected to cost US$500,000 and have approximately 50 batteries available without requiring reservations. Elon Musk said the battery swapping service would be offered for the price of about 15 US gallons (57 l; 12 imp gal) of gasoline at the current local rate, around US$60 to US$80 at June 2013 prices. Owners may pick up their own battery pack fully charged on the return trip for no extra payment. Tesla will also offer the option to keep the pack received on the swap and pay the price difference if the battery received is newer; or to receive the original pack back from Tesla for a transport fee. The billing will be handled via customer credit card on file with Tesla. Pricing had not been determined as of June 2013[update]. The California Air Resources Board staff considered modifying the Zero Emission Vehicle (ZEV) regulation to exclude battery swapping as a "fast refueling" technology; this change would deny Tesla some of the ZEV credits that the manufacturer might otherwise receive when the battery-swapping station is placed in service in California. After criticism from several motoring manufacturers, this proposal was withdrawn. Tesla announced a higher-capacity "Megacharger" along with the unveiling of a prototype for its Tesla Semi, a semi-trailer truck, in November 2017. Trucks would use the Tesla Megacharger Network to charge. The solar-powered Megacharger Network stations would charge the semi trucks with 400 miles (645 km) of charge in 30 minutes, out of the total capacity of 500 miles (805 km) in the battery pack. To accomplish this, it will likely have an output level over one megawatt. ^ a b c d e f "Superchargers". Tesla. 2019-01-28. Retrieved 2018-05-12. ^ Loveday, Eric (2016-07-10). "Tesla Ups Supercharger Charging Rate For Refreshed Model S 90D & P90D". Inside EVs. Retrieved 2016-09-30. ^ "Tesla Motors". Tesla Motors. Retrieved 2016-03-03. ^ Ohnsman, Alan. "Tesla Is Doubling Its Global Charging Network Ahead Of Model 3 Rollout". ^ a b c Lambert, Fred (2016-07-20). "Tesla quietly upgraded its Superchargers for faster charging, now capable of 145 kW". ^ "Tesla Supercharger inside". Electrek. 2016-10-03. ^ "Tesla Charger 40 A Module". IHS Technology. 2015-02-06. ^ "Tesla Charger 40 A Module inside". IHS Technology. 2015-02-06. ^ "Tesla Generation 2 Charger 48 A Module". TeslaMotorsClub. 2015-07-01. ^ "Tesla Generation 2 Charger 48 A Module (3x16A Sub-Chargers) inside". diyelectriccar.com. 2016-07-01. ^ a b "ASA Ruling on Tesla Motors Ltd". www.asa.org.uk. Archived from the original on 2017-02-04. ^ Gold, Aaron (2016-05-26). "As Tesla Sales Grow, Can Superchargers Keep Up?". Consumer Reports. Retrieved 2017-03-06. each Supercharger port supplies two outlets, and when both outlets are in use the charging slows down. ^ "Elon Musk on Twitter". Twitter. Retrieved 2016-12-28. ^ Lambert, Fred (2016-12-26). "Tesla's upcoming 'Supercharger V3' is the last piece of the EV adoption puzzle – and means more ZEV credits". Electrek. Retrieved 2017-03-06. ^ "Tesla Urban Supercharger: Compact 72 kW Stations Designed For City Centers". Inside EVs. 2017-09-11. Retrieved 2019-01-28. ^ a b "Tesla Motors Launches Revolutionary Supercharger Enabling Convenient Long Distance Driving - Press Releases". Tesla Motors. 2012-09-24. Archived from the original on 2012-09-27. Retrieved 2017-08-03. ^ a b Tesla Press Release (2012-09-25). "Tesla launches first six Supercharger locations; 100 kW charging, with 120 kW in future". Green Car Congress. Retrieved 2012-12-23. ^ Tesla resurrects free unlimited Supercharging on Model S and Model X Retrieved May 24, 2017. ^ Lambert, Fred (2018-09-21). "Tesla brings back free Supercharging to inventory cars and Model 3 to help sell cars in end of quarter rush". Electrek. Retrieved 2019-01-28. ^ "REVIEW: Type 2 Charging Cable with Built-in Chargeport Opener". TESLARATI. 2015-06-05. Retrieved 2017-03-21. ^ "Model 3 - Combined Charging System 2 (Combo 2)". Retrieved 2018-11-22. ^ "Charging infrastructure". DIN e. V. Retrieved 2017-03-21. ^ Lambert, Fred (Jun 19, 2017). "Tesla is 'actively talking to other automakers' about opening up its Supercharger network, says CTO JB Straubel". Electrek. Retrieved 2017-10-13. ^ Hruska, Joel (June 11, 2014). "Tesla reveals plan to share Supercharger network with other electric car makers". Extremetech. Retrieved 2017-10-13. ^ a b "Tesla unveils new 'urban' Supercharger with a slower dedicated charge rate". TESLARATI. 2017-09-11. Retrieved 2017-09-15. ^ Pachal, Pete (2016-04-01). "Tesla plans massive expansion of supercharger network". Mashable. Archived from the original on 2016-04-06. Retrieved 2016-06-06. ^ "Superchargers". supercharge.info. 2016-04-06. Archived from the original on 2016-10-05. Retrieved 2015-07-06. ^ a b Heisler, Yoni (2017-12-17). "Teslas used for commercial purposes like Uber are no longer welcome at Supercharger stations". BGR. Retrieved 2017-12-19. ^ a b c d Lavrinc, Damon (2014-12-17). "What Will Tesla And Elon Musk Over Promise Next?". Jalopnik. Retrieved 2014-12-18. ^ "Tesla opens first solar supercharger in Belgium". 2017-06-11. Retrieved 2017-08-03. ^ Lambert, Fred (2016-08-17). "Tesla now has 34 vehicles in its fleet for each Supercharger – A look at the network's growth ahead of the Model 3". Electrek. Retrieved 2016-08-17. ^ "Tesla Supercharger Stats". Tesla Motors Club. Retrieved 2016-11-15. ^ "Letter to the SEC, File No. 001-34756". Tesla. 2014-02-26. Retrieved 2017-03-06. ^ "Home charging installation". Tesla. Archived from the original on 2017-01-14. Retrieved 2017-03-06. ^ Kane, Mark (2014-08-12). "Share of Supercharged Miles For Tesla Model S Increased From 5% to 8%". Retrieved 2017-03-06. ^ Lambert, Fred (2016-10-03). "Tesla to deliver its largest privately-owned Supercharger station to a taxi fleet in Montreal". Electrek. US. Retrieved 2016-10-18. ^ Matousek, Mark (2017-12-18). "Tesla is banning commercial drivers from its Supercharger stations". Business Insider. Retrieved 2017-12-19. ^ Lambert, Fred (2017-01-01). "Tesla is extending unlimited Supercharging for cars ordered in the next 2 weeks". Electrek. Retrieved 2017-01-01. ^ Liptak, Andrew (2017-05-21). "New Tesla owners can now get free charging with a referral code". The Verge. Retrieved 2017-06-02. ^ "Supercharging". www.tesla.com. Retrieved 2017-09-14. ^ "An Update to Our Supercharging Program". Tesla Motors. 2016-11-07. Retrieved 2016-11-07. ^ "Improving Supercharger Availability". www.tesla.com. Retrieved 2016-12-28. ^ Witt, Daniel. "Tesla Motors Presentation - Supercharger Expansion" page 13. Tesla, 2015. ^ "Tesla Superstation locations". Tesla Motors. Archived from the original on 2013-07-08. Retrieved 2017-08-29. ^ "Tesla Supercharger – Electric Vehicle Charging System". Black & Veatch. Archived from the original on 2016-12-25. Retrieved 2017-03-06. ^ Sorensen, Chris (2013-07-24). "A morning with Tesla's Model S". Maclean's. Retrieved 2013-07-29. ^ Lambert, Fred (2016-11-16). "Tesla is increasingly able to make businesses pay for the electricity delivered by its Superchargers". Electrek. Retrieved 2016-11-16. ^ Motavalli, Jim (2012-11-13). "At Tesla's Party, Superchargers and Delivery Dates". The New York Times. Archived from the original on 2013-04-05. Retrieved 2012-12-23. ^ a b c "Find Us". Tesla Motors. Archived from the original on 2016-07-30. Retrieved 2017-08-29. ^ "Anchorage EV charger". PlugShare. ^ "Tesla Targets City Centers for Supercharger Network Expansion". Bloomberg.com. 2017-09-11. Retrieved 2017-09-12. ^ Golson, Jordan (2017-04-24). "Tesla is making a big expansion to its Supercharger network". The Verge. Retrieved 2017-06-02. ^ Cole, Jay. "Tesla Urban Supercharger - Compact 72 kW Stations Designed For City Centers". Inside EVs. ^ a b Godske, Bjørn (2014-10-12). "Tesla gør Køge til knudepunkt for hurtigopladning" [Tesla makes Køge center for supercharging] (in Danish). Ingeniøren. Retrieved 2015-02-05. ^ "First look at world's largest Tesla Supercharger station in Shanghai, China". Johnny B Tech. 2017-10-23. Retrieved 2017-10-23. ^ "Tesla Model 3 Price Announced; Elon Musk Confirms India Launch". NDTV auto. India. 2016-04-04. Retrieved 2016-05-09. ^ Bhushan, Kul (2016-04-01). "Tesla to set up an India-wide supercharger network for Tesla Model 3 launch, Elon Musk confirms". BGR. India. Retrieved 2016-05-09. ^ "Tesla opens "Mega" Superchargers with lounge, food services, kid's area, and pet amenity". www.teslarati.com. Retrieved 2018-03-28. ^ "10 nouvelles bornes Tesla à Mâcon". www.lejsl.com (in French). Retrieved 2018-09-18. ^ a b Green, Catherine (2013-06-21). "Tesla shows off its battery-swapping station: 90 seconds and less than $100". Silicon Valley Mercury News. Retrieved 2013-06-23. ^ "Tesla's battery-swap stations will finally arrive in December". Engadget. ^ a b Tesla Motors Team (2014-12-19). "Battery Swap Pilot Program". Tesla Motors. Retrieved 2014-12-20. ^ a b "Elon Musk Says Tesla May Be Giving Up on Battery Swapping Stations". Popular Mechanics. 2015-06-10. Retrieved 2015-06-24. ^ a b "Tesla Motors demonstrates battery swap in the Model S". Green Car Congress. 2013-06-21. Retrieved 2013-06-22. ^ Sebastian Blanco (2009-09-27). "REPORT: Tesla Model S was designed with battery swaps in mind". Autoblog Green. Retrieved 2013-06-22. ^ "Tesla unveils world's first mass-produced, highway-capable EV". ^ Zhang, Benjamin (2015-06-27). "Tesla's battery-swapping plan isn't working out". Business Insider. US. Retrieved 2016-08-08. ^ Fehrenbacher, Katie (2013-08-07). "Record sales, upbeat Q2 earnings for electric car maker Tesla". Gigaom. Retrieved 2013-08-08. ^ Alan Ohnsman and Mark Chediak (2014-02-28). "Tesla Motors Inc's Elon Musk says renewable energy shift to bring 'strife' for utilities". Financial Post. Bloomberg News. Retrieved 2014-03-19. ^ ""ZEV 2013 Final Statement of Reasons"" (PDF). CEPA - Air Resources Board - ZEV 2013. US. Retrieved 2014-12-26. ^ Brett Williams (2017-11-17). "Tesla's new 'Megachargers' will give its Semis power for 400 miles in 30 minutes". Mashable. ^ a b "Close-up look at the Tesla Semi "Megacharger" charging port". Teslarati. November 12, 2017. Retrieved 2018-01-14. ^ "Tesla Semi — 8 Charger Holes, 800 kWh Battery? Tesla Megacharger — 1.6 Megawatts?". CleanTechnica. 2017-11-17. Retrieved 2017-11-17. ^ "Up Close Look At Tesla Semi Megacharger Port". InsideEVs. 2017-11-20. Retrieved 2017-11-20. This page was last edited on 21 March 2019, at 12:07 (UTC).